Pressing the [AM] button selects the AM band. AM Mode is displayed on the LCD. 2. 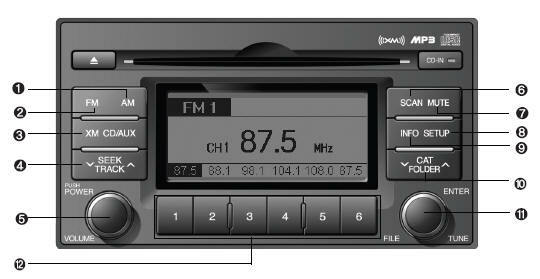 FM Selection Button Turns to FM mode and toggles FM1 and FM2 when the button is pressed each time. Turns to FM mode, and toggles in the order of XM1➟XM2➟XM3➟···➟XM1··· when the button is pressed time. o When the [SEEK ] button is pressed, it reduces the band frequency by 200khz to automatically select channel. Stops at the previous frequency if no channel is found. o When the [SEEK ] button is pressed, it increases the band frequency by 50khz to automatically select channel. Stops at the previous frequency if no channel is found. Press this button to turn to the SCROLL, XM option, RETURN and P.BASS adjustment mode. If no action is taken for 5 seconds after pressing the button, it will return to the play mode. (After entering SETUP mode, move between items using the left, right and PUSH functions of the TUNE button.) The setup Items changes from SCROLL <->XM<->RETURN<->P.BASS. Pressing the Title -> Artist -> Album Category -> Channel -> Title-KEY for 3 seconds will display the corresponding text then become restored. After pressing (the) Key, if the text to be displayed is longer than the LCD text line, then rotating the TUNE Knob will operate the page up function displaying 8 characters for 3 seconds each-displayes the maximum lines of text supported by XM. Moves [CAT ] Button when Category Up search operation. o Category is moved Up fronm the category currently being received and Category name becomes displayed. o If the Key is Pressed While in the last Category, then the first category will become displayed and operation will ne repeated. o Corresponding category can be selected by pressing ENTER. Moves [CAT ] Button when Category Down search operaton. o Category is moved Down from the cat-egry currently being receiced and Category Name becomes displayed. o If the Enter Key is nit pressed within 5 seconds, then the previous mode will be restored. o If the [CAT ] Key is pressed while in the first Category, then the last category will become displayed and operation will be repeated. o Corresponding category can be seletcted by pressing ENTER.